3 (quote) Thank you. The application is now available. Clarity - Contact thumbnails you don't mind looking at. Announcement from Kevin M: Clarity v1.2-cfad189 now available! Clarity is an Xposed module and root Android application for increasing the size and quality of contact thumbnails in the Android contacts database. It's comprised of two components. 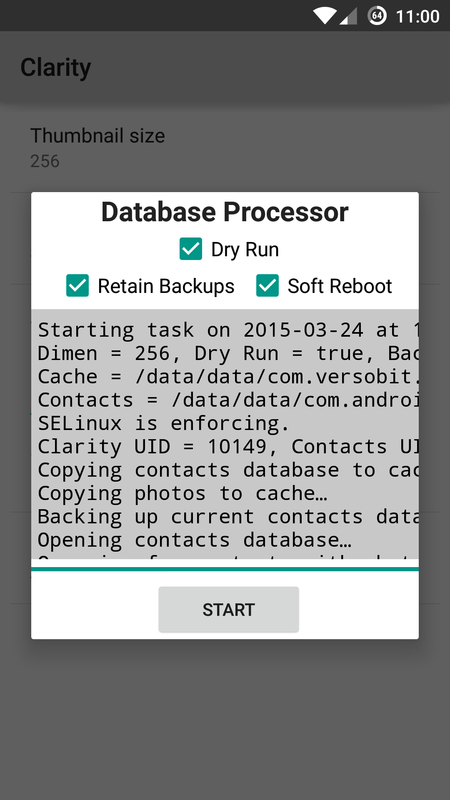 An Xposed modification and a root-required Database Processor. Clarity also increases the quality and size of locally stored album art. Android stores two versions of contact images. The contact photo and the contact thumbnail. While both are downscaled appropriately from the original image, the two are very different in size. Contact photos clock in at around 720×720 pixels or so depending on the original image. Contact thumbnails are a measly 96×96 pixels. Contact photos are used in places where contact imagery is going to be distinctively large like the KitKat/Lollipop Phone app. Or when you receive an incoming call. Thumbnails are used for notifications, messaging applications, and other roles which the full contact photo is unnecessarily big. Unfortunately, as screen PPIs have skyrocketed since the 96×96 limit was put in place, contact thumbnails are now too small for their original purpose. Regardless, most applications continue to use contact thumbnails. Clarity forces Android to use a user-defined size (defaulting to 256×256) when adding contact thumbnails to the database. While these new images are larger and look much better they will load slightly slower and increase memory requirements. For newer devices this should not be a problem. For reference, I have not witnessed any side effects on my Galaxy S4 using the default 256×256 setting. Since the size can be adjusted you can optimize it for your device. In the name of simplicity, Clarity does not change the method Android uses to downscale contact thumbnails, just the final dimensions. However since Clarity allows you to increase the size of the thumbnail and consequently decrease the magnitude of the downscale, there will be noticeably fewer artifacts in your new thumbnails. The Xposed module does not magically increase the quality of thumbnails already added in the database. It only affects newly added/updated contacts and images. To upgrade your entire contacts database either use the Database Processor detailed below or re-import the contacts. Re-importing may require you to deconnect/desync the account the contacts are associated with and then reconnect/resync the account. Some sync applications may have a force refresh option and that should work nicely. For instance, HaxSync has a Force redownload option under its contact settings. When the Xposed module is activated, Clarity will also up the size of locally stored album art (for instance, MP3s on the external storage). Just like the contact thumbnail part of the module, existing album art is unaffected. To get Android to reprocess all the album art on your device you must delete all the files found in the albumthumbs directory. This is usually found somewhere on your external storage. Popular paths are /storage/emulated/legacy/Android/data/com.android.providers.media/albumthumbs and /storage/sdcard0/Android/data/com.android.providers.media/albumthumbs. Different devices and ROMs can have different paths but the last /Android/data/com.android.providers.media/albumthumbs bit should stay the same. Once that directory has been cleared out, higher quality album art will be regenerated by Android on demand (as they are needed). See Android issue 73635 for more information about the album art problem. 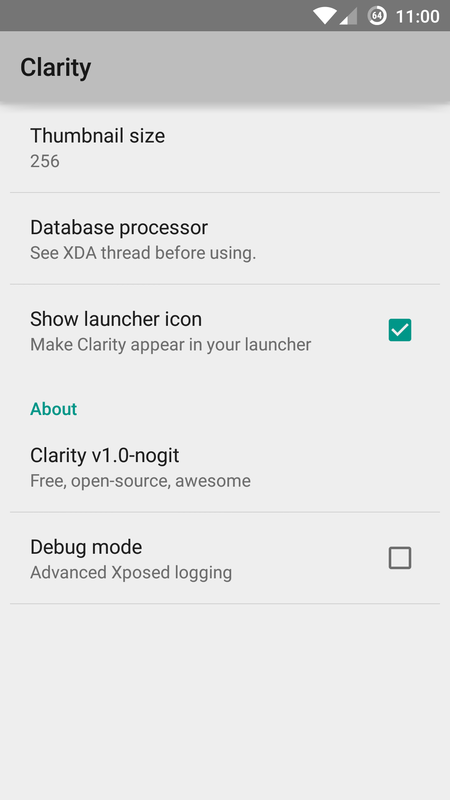 In addition to the Xposed-based modification described above, Clarity includes a Database Processor. This powerful feature forcibly updates every contact thumbnail in your database. It rips out the internal contacts database file, finds all your contacts with photos and puts in new thumbnails. It'll then replace the old database with the new one. It is highly recommended to immediately reboot after processing to avoid Android going berserk. It will if you don't. While powerful, the Database Processor is also extremely dangerous. I am not responsible for any damage to your device as a result of using Clarity. It performs several operations as root and modifies core Android files that were never meant to be touched by anything other than Android itself. I highly recommend a full recovery-based backup of your device alongside the built-in backup feature. Please use the dry-run feature first (hell, multiple times even) to ensure the operation will succeed for your ROM. It is possible a successful dry-run could still fail when doing the real-deal so, as I mentioned before, backup your stuff. The built-in contact backups will be saved to a Clarity folder on your "primary" external storage. What primary means depends on your ROM and device. It could be your actual external SD card or it could be an internal storage location. Regardless, the current backup location will be noted, assuming backups are enabled, in the processor's log. As an added bonus, if the backup feature is on it will also save the log file alongside your backups! The Database Processor has been tested on CM (CyanogenMod) 10 (based on Android 4.1.2), CM 11 (based on Android 4.4.4), CM 12 (based on Android 5.0.2), and CM 13 (based on Android 6.0.1). It should work on any AOSP-based ROM from Ice Cream Sandwich (4.0) to Marshmallow (6.0). For stock ROMs and anything created by carriers I have no idea. If it works for you please report back! If it doesn't, well, report that too. Free and open-source software. No nags. No data collection. No secrets. Does not appear to work with Google-synced contact photos. May not work with all devices and ROMs. See the following post. Make certain you have Xposed installed before continuing. Install the app by a) searching for it in the Xposed Installer or b) manually through the APK provided on GitHub or the Xposed website. Configure the app in its settings panel. It can be accessed through the module section of the Xposed Installer or by the launcher shortcut. Enable the module in the Xposed Installer. The Xposed module will only update contact photos that are modified or added to the database after it is turned on. The database processor will attempt to update the contact photos in place and right away. To avoid using the database processor your contact photos must be manually refreshed. How/if this can be done and how easily is dependent on how you sync your contacts. For instance, if you use HaxSync you can update all your photos by going to Settings app -> Accounts -> HaxSync -> Advanced Settings -> Contact Settings -> Check Force redownload. Hit back twice. Select your account name at the top. Click Contacts to uncheck it. Recheck it and wait for sync to finish. See the GitHub repository for the definitive changelog. * Will now increase the size and quality of locally stored album art. Initial release. Make sure to see the README or XDA thread! MD5 checksums are available on the Xposed Repo and XDA. Q: Something went horribly wrong! How do I restore from one of the backups? A: Ouch! Clarity stores backups on your "external storage." Depending on your device and ROM this could be an actual SD card or internal. If your device has two check both. It will be in a directory named Clarity. In the Clarity backup directory there will be sub-directories with dates. Select the one before everything went to hell. You'll find up to three files: contacts2.db contacts2.db-journal, and dbprocessor.log The .db file(s) are the actual contacts databases. The dbprocessor.log is your log file and has lots of great information for us to use. Now that we have located everything we need let's get restoring. If your device still boots and you can navigate around (even if things are crashing every few seconds) try this. If you have a custom recovery that supports adb then this will work as well if you boot into it. Grab the adb command line tool. For Windows check here. For Linux and Mac see here. Now put your device in debug mode. Go to the settings app. Tap About phone. Keep tapping Build number until it says you are a developer. Go back and select Developer options. Turn the development options "on" if needed. Under Debugging turn on Android debugging. Now connect your device to your computer. It should say something about debugging being enabled in the status bar. Make certain your phone is unlocked. If it says something about allowing the computer debug access to your phone please accept it. Type adb version and hit enter. If your get something about it being not found then adb isn't installed in your PATH or you're not in the directory in which adb was extracted. You can navigate to that directory with the cd command. So to navigate to the system32 folder on Windows, for instance, I'd type cd C:Windowssystem32 and hit enter. Type adb shell and hit enter. This will dump us into a shell instance directly on your device. Type id and hit enter. If the first bit is not uid=0 then unlock your device and type su and hit enter. If your device prompts for superuser access please grant it. You should now see the backup files if you type ls and hit enter. Great. Now to move these into place. Open your dbprocessor.log file on your device through a file manager or move it onto your computer to read its contents. You can read it through the command line if you wish but it's much more convenient to be able to copy and paste if needed. Note the Contacts UID and Contacts directory. Mine is 10006 and /data/data/com.android.providers.contacts respectively. Reboot immediately by typing reboot and hitting enter. All done. Your contacts database has been restored. Took a backup with your custom recovery before processing? Just restore from the backup to get your device back to normal. Clarity is developed in my spare time and will always remain free and open-source software. If you find this application useful please feel free to donate. Clarity should work with CyanogenMod and other closely AOSP-based ROMs. Other ROMs like the stock ones found on most popular Android devices may not work with Clarity. If you have a device or ROM that Clarity works or does not work with (and is not already on the below list) please tell me! Thank you. The application is now available. Works fabulously with BlissPop 2.2 OPO ! Testing after a while on XPERIA! This is awesome, especially for Android wear!! Does it help with WhatsApp too? I fear not since it has different pictures...which are ugly because of an 8bit definition worth of MS-DOS "prince of persia"!! So, that said, which apps are affected in addition to messenger and hangouts? Textra maybe? Others? I've been waiting for this my entire life haha, thank you! Fantastic! Works great. All I had to do was uncheck Contacts in sync settings and recheck it. Thanks! Both the DB processor and the Xposed mod seem to be working well? It will help with any application or system software that makes use of the contact thumbnail stored in the database. From my personal experience this is a majority of applications. It's also why Clarity fixes contact imagery on Android Wear apps/notifications. It will not work for any apps that use their own contact system instead of the built-in Android one. A good example is Google Hangouts which will use its own contact photos for your Google+ contacts. Luckily the Google+ photos tend to be pretty decent quality-wise. Hangouts will fall back to your contacts database if that person does not have a Google+ profile and so Clarity will help there. [QUOTE=Kevin M;59678574]Thanks! Both the DB processor and the Xposed mod seem to be working well? yes both are working smoothly ! This is something that should be done by Google themselves ! Tested on BlissPop and Temasek 5.0.2 Lollipop for OnePlus One ! Yes both are working seamlessly ! Tested on BlissPop and Temasek 5.0.2 Lollipop for OPO !